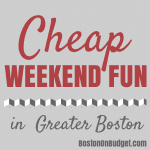 Cheap Weekend Fun in Boston for July 5-6, 2014! Happy Fourth of July Weekend!!! If you are looking for a Fireworks display in or around Boston, please head here for a huge list! Also, don’t forget to check out my Free Friday Events post for free events happening on the Fourth of July. However, please keep in mind that some events have been moved due to weather including the annual Boston Pops Fireworks, which will be tonight, 7/3/14. Don’t forget you can also receive FREE Boston Duck Tour tickets from July 3-5, 2014 thanks to Yoplait Greek, on a first-come, first-serve basis. Boston Harborfest: July 2-6, 2014 around Boston. Celebrate the 33rd Annual Harborfest with festivities all around the city. Bank of America’s Museum on Us Weekend: Saturday and Sunday, July 5-6, 2014. Bank of America & Merrill Lynch cardholders can get into select museums the first weekend of every month for free by showing their bank card (per cardholder, not family). Museum of Fine Arts, MIT Museum and other museums across the state participate. Kid Price Saturday at Franklin Zoo: Pay and feel like a kid the first Saturday of every month at Franklin Park Zoo between 10 a.m. & noon for just $11.95. Head to Stoneham, MA to the Stone Zoo between 10am-12pm and pay $6.95 for admission. Magic Family Film Festival: Saturday, July 5, 2014 at the Prudential Center courtyard at dusk. Enjoy a free outdoor movie screening every Saturday night at dusk. This week’s free outdoor movie is Frozen! If you are visiting Boston this weekend, don’t forget to check out my post Is the Go Boston Card Worth It? and for updated discounts due to the holiday. Also, don’t forget to check out Free Fitness Classes & Events in Boston and Ways to Save at Fenway Park for some fun savings as well as 27 Free Things to Do in Boston this Summer. Hope you all have a great weekend and Happy July Fourth Weekend! I can’t believe it is already the last weekend in JUNE! Here are some fun and free event suggestions happening in Boston this weekend! Frog Pond Spray Pool Opening Day: Saturday, June 28, 2014 at Boston Common Frog Pond. Kick off summer with the annual opening of the Frog Pond Spray Pool! Shakespeare’s As You Like It: Saturday, June 28, 2014 at 2pm & 6pm and Sunday, June 29, 2014 at 2pm at Dedham’s Historic Fairbanks House. Stop and see a free performance of Shakepeare’s As You Like It on the lawn in Dedham. Free, but suggested donation welcome. Free Sailing Open House: Saturday, June 28, 2014 from 1-4pm. Boston Sailing Center is offering free sails on Boston Harbor on Saturday afternoon– last free chance of the summer! Free Yoga Class at Piers Park: Sunday, June 29, 2014 from 6-7pm at Piers Park in East Boston. Enjoy a free yoga class on Sunday evening in East Boston! Pops on the Lawn: Sunday, June 29, 2014 at 3pm at Sennott Park in Cambridge. Enjoy the afternoon with a free full-orchestra concert in Cambridge. ICA: Saturday, June 28, 2014. The ICA is free for families (with children under 12) the last Saturday of every month, except December. MIT Museum: Sunday, June 29, 2014. The MIT Museum is free the last Sunday of every month through June, so last chance for a little while! Also, don’t forget to check out Free Fitness Classes & Events in Boston since there are a lot of free fitness activities and events happening on the weekends this summer as well as 27 Free Things to Do in Boston this Summer. Hope you all have a great weekend! What are you doing this weekend– Did I miss any great and free events in Boston this weekend? Happy First Official Weekend of Summer in Boston!!! Tomorrow I will be throwing out a lot of suggestions of fun things to do this summer in Boston so make sure to check the blog tomorrow for that! Or you can always subscribe to the daily newsletter to get it right in your inbox! But don’t forget the free outdoor movie at the Hatch Shell kicks off Friday night as well as free outdoor movies at the Boston Harbor Hotel currently underway on Friday nights! Formaggio Kitchen Free Cheese Tasting: Saturday, June 21, 2014 from 11-2pm at Formaggio Kitchen in Cambridge. Free cheese tasting on Saturday with two world-renowned cheese makers from Italy and France. Out of Park Event: Sunday, June 22, 2014 at Franklin Park in Dorchester at 4:05pm. Cheer on the Red Sox on the big screen at Franklin Park on Sunday. Free. NEWHBA-Fest 2014: Saturday, June 21, 2014 at Christopher Columbus Waterfront Park. A day long festival celebrating health and beauty in Boston. Free exercise, live music, exhibits and more. The 7th Annual Make Music: Saturday, June 21, 2014 in Harvard Square from 2-10pm. Celebrate summer with over 70 musicians across the U.S. on 12 different stages! Free and open to the public. Chinatown Main Street Festival: Sunday, June 22, 2014 from 10am to 5pm in Chinatown. Enjoy this all day festival with Chinese Folk Dance, Martial Arts Demo, and much more! Free. Sunday Parkland Games Begins: Every Sunday starting Sunday, June 22, 2014 through September 28, 2014 from 3:30pm-6pm in Cambridge. Free Sunday games along the banks of the Charles River every Sunday in the summer. Also, don’t forget to check out Free Fitness Classes & Events in Boston since there are a lot of free fitness activities and events happening on the weekends this summer. Hope you all have a great weekend! Happy (almost) weekend. If you are a Dad or spending Father’s Day on Sunday with a Dad, make sure to check out Where Dad Gets in Free on Father’s Day in Greater Boston for some Father’s Day freebies! 103.3 Amp Radio’s Birthday Bash: Sunday, June 15 2014 at Gillette Stadium in Foxboro. Amp Radio is celebrating their 2nd Birthday with a free concert featuring Iggy Azalea, Austin Mahone, G.R.L., Little Mix and MKTO! Health & Fitness Expo: June 14-15, 2014 at the Hynes Convention Center. Check out the free Health & Fitness Expo with free health screenings, free fitness activities, cooking demos, celebrity appearances, and much more! Free. Boston Pride Week Continues: Ending Sunday, June 15, 2014. Boston Pride week is underway and the Boston Pride Parade kicks off at 11am on Saturday. Boston Dragon Boat Festival: June 14-15, 2014 along the Charles River. Every year 30-40 teams from the US and Canada compete over a 500-meter course in an energetic race. Bunker Hill Day Parade: Sunday, June 15, 2014 at 12:30pm in Charlestown. A tradition since 1786, the parade commemorates the Battle of Bunker Hill. Free. Quincy Flag Day Parade & Celebration: Saturday, June 14, 2014 in Quincy, MA. Pay tribute to old glory with the longest-running parade of its kind. Free. Chelsea Art Walk: June 14-15, 2014 from 12-6pm in Chelsea, MA. Visit art galleries and alternative venues in Chelsea to check out local art! BOKS Active Kids Day: Saturday, June 14, 2014 from 11-4pm at Reebok Headquarters in Canton, MA. Active Kids Day is a free event for the entire family with performances from Coco Jones, Lil Phunk, and much, much more. Free. Harvard Museum of Natural History: Massachusetts residents are admitted free every Sunday morning from 9am to Noon year-round with proof of residency. National Get Outdoors Day: Saturday, June 14, 2014. Apparently it is National Get Outdoors Day, so make sure to get outside and have some (free) fun! Also, don’t forget to check out Free Fitness Classes & Events in Boston since there are a lot of free fitness activities and events happening on the weekends this summer. The Red Sox are also back in town this weekend so if you are heading to game, check out my Ways to Save at Fenway Park post! Hope you have a great weekend and Happy Father’s Day to all my Dad readers! Are you looking where Dad’s get in free on Father’s Day? 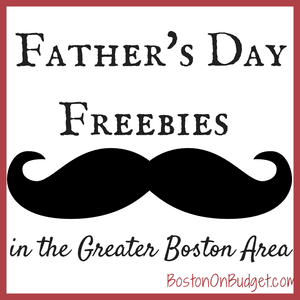 Here’s a few Father’s Day freebies and deals in the Greater Boston area for Sunday, June 15th, 2014! Davis Farmland (Sterling, MA): Dads get in free with a complimentary massage too! Happy Father’s Day to all those awesome dads out there! If I missed any great freebies and discounts, please let me know in the comments below! 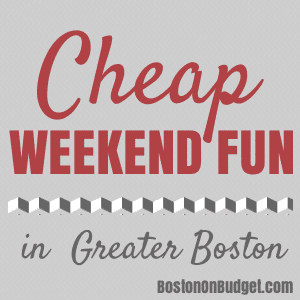 Here’s some ideas of fun and cheap things to do in Boston and Beyond for the first full weekend of June! Free Fishing Weekend: Saturday and Sunday, June 7-8, 2014 across Massachusetts. No fishing license needed to fish at any public freshwater lake, pond, reservoir, river or stream statewide starting at 12 a.m. on Saturday to 11:59 p.m. on Sunday. 36th Annual Coolidge Corner Arts Festival: Saturday, June 7, 2014 from 10-6pm. Check out the work of over 75 artists at this local art festival. Free. 35th Annual Cambridge River Festival: Saturday, June 7, 2014 from 12-6pm. Celebrate the arts with live music, interactive performances, dances, and much more! Free and open to the public. Free. Boston Pride Week: Begins Friday, June 6, 2014 to Sunday, June 15, 2014 across Boston. Boston Pride Week kicks off on Friday, June 6th and falls into next weekend with an array of fun events. Piers Park Free Sailing Day: Sunday, June 8, 2014 from 12-4pm. Get on the water and sail for free. This event is expected to be popular so there will be free activities to take advantage of while you wait. Free. National Trails Day: Saturday, June 7, 2014 from 10am-12pm. Volunteer to restore trails in the woodlands of Franklin Park. Wear old clothes, bring work gloves if you have some and meet at Valley Gates Parking Lot, midway along Franklin Park Road in Dorchester. Free. Cultural Survival Bazaar: Saturday, June 7, 2014 from 10-5pm in Copley Square. A festival of native arts and cultures in Copley Square on Saturday. Free. Somerville Food Truck Festival: Saturday, June 7, 2014 from 11-4pm. If you love food trucks, this festival is for you! Admission is $5 to get in & then you do need to pay for what you eat. Bank of America’s Museum on Us Weekend: Saturday and Sunday, May 3-4, 2014. Bank of America & Merrill Lynch cardholders can get into select museums the first weekend of every month for free by showing their bank card (per cardholder, not family). Museum of Fine Arts, MIT Museum and other museums across the state participate. Hope you have a great weekend whatever you decide to do! And don’t forget to leave a comment if I missed any fun and free events in and around Boston this weekend!